In spectrum mode when applying the square signal 1kHz to pcsu1000 I have 2 different results . With 12 kHz freq.range I have 2kHz harmonics(even harmonics) , with 30kHz freq.range I have only odds. What is an issue ? The even harmonics are due to aliasing. 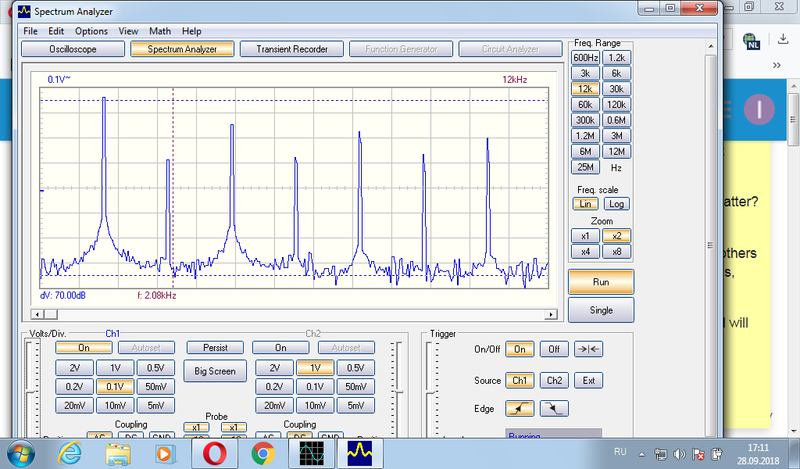 At 12 kHz freq.range the sample rate is 25kHz. So all the harmonics higher than 12.5kHz get folded back. In this video the issue is nicely demonstrated: Practical Aliasing of a Square-Wave. Not a simulation! Just to make it crystal clear, is that aliasing due to "non perfect " filtering on analogue input before converting to digital form(does pcsu have this low pass filter on input ? i presume should be there) or due to fundamental FFT process applied ? does pcsu have this low pass filter on input ? There is no low pass filter on the input.